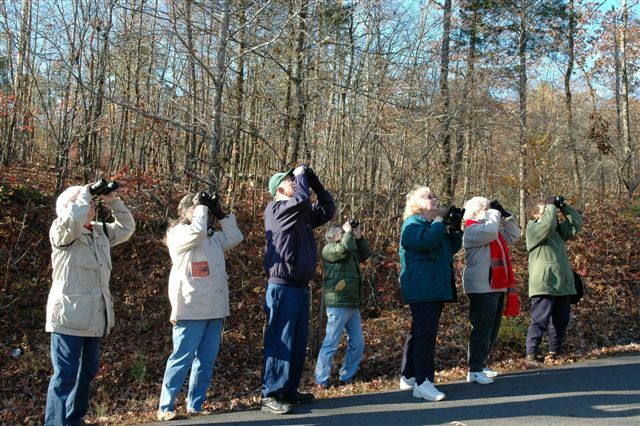 Often beginning birders use whatever binoculars happen to be available. Usually those are not satisfactory for bird watching. Using poor quality optics while trying to see specific field marks or subtle colors of birds can be extremely frustrating. Your ability to see the birds is only as good as your optics. Choosing the right binoculars for you is an individual decision. There are numerous, and sometimes confusing, factors to consider when choosing the right pair of binoculars. COST - The first decision to be made is how much money you have or want to spend on optics. Unfortunately, good optics are not inexpensive, and the best optics are very expensive. A good pair of binoculars will last many years or even a lifetime and will definitely enhance your birding experiences. Magnification - The next decision is how much magnification. Binoculars are described by two numbers, such as 7x35. The first number tells you the magnification or how many times the object is being enlarged. Decide whether you want 7, 8, or 10 power binoculars. For beginning birders either 7 or 8 power is usually recommended. Many inexperienced birders assume that the higher magnifications are better. Binoculars with magnification higher than 10 power will be too heavy to hold steady and will have a diminished field of view. The second number gives you the diameter of the objective lens in millimeters. This determines how much light enters the binoculars and will affect the brightness of the image. Most experienced birders choose models from 35 to 42 millimeters. Field of view - A wide field of view is essential for finding birds quickly and being able to follow them in flight. The field of view is given in the specifications for binoculars. For a detailed explanation of field of view, check out one or two of the listed websites. Comfort - Because you will be using your binoculars for several hours at a time, be sure you buy the right pair. They should feel good in your hands and have an easy to reach and use focus knob. Getting help - One way to get useful information is to go birdwatching with others. Look at the binoculars they are using and ask questions. However, remember that you want binoculars that fit your own needs. Purchasing - Ideally, the best place to shop would be in a store that has a wide selection of models that you can test. Unfortunately for us, that option does not exist. You can begin by checking the binoculars at local stores. Don't just look. You want to hold the binoculars and check out the feel, ease of use, and quality of image. If you decide to order binoculars, be sure to check out the return policy as some companies even have a "no questions asked" return policy for a limited amount of time. Do not buy zoom or image-stabalized binoculars as they are heavy, may give up brightness, and have a reduced field of view. Do not ask non-birders for advice on binoculars. While hunters, hikers, and other groups may know a lot about optics, they have different needs than birders. Binoculars have several adjustments that allow you to focus them for your particular eyes. 1. Decide whether you will be wearing corrective lenses while using the binoculars. Some eyeglass wearers prefer to take them off while looking through the binoculars, but if you see better with your glasses, then you should wear them while using binoculars. On some binoculars, the eye cups fold down, but on better binoculars the eyecups extend and retract. Use the eye cups in the fully extended position without glasses and in the retracted position with your eyeglasses or adjust to an in-between position as needed for your eyes. 2. Adjust for the distance between the eyes by moving the sides or barrels of the binoculars until they are exactly in front of your eyes, and you see only one image. 3. Find the center focus adjustment and the adjustment on one eyepiece. 4. Look through the eyepiece that does not have the eyepiece adjustment while closing the other eye. Locate an object with distinct details such as letters on a sign. Move the central focus adjustment until the image is clear and in focus. 5. Shut the eye you just used and look through the eyepiece that has the eyepiece adjustment. Use that adjustment ring to focus on the same object as before. 6. Open both eyes, and you should be able to see the object clearly. You can then focus on other objects by using just the central focus knob. If you are sharing binoculars, the other person will have to make adjustments in the binoculars. Keep binoculars clean. Don't touch the lenses with your fingers. Never clean the lenses with a tissue or other paper product because the wood fibers may scratch the lens coatings. Also do not use commercial glass cleaners. Clean your binoculars with a lens tissue or a micro-fiber lens cloth from an optics or camera store. A lens brush or a can of compressed air is useful for removing dust particles. Then spray lens cleaner on the cloth and use to carefully clean the lens. Finally, wipe them with a dry part of the cloth. Be careful to protect your binoculars while using insect repellant. If repellant gets on your hands, wipe it off before handling binoculars. First practice with a distinct stationary object that is about 25 feet away. Fix your eyes clearly on the target. Then, bring the binoculars up to your eyes in one smooth movement without taking your eyes off the target. Resist the tendency to look down at the binoculars as you bring them up to your eyes. Doing so will cause you to lose the object. If you don't see the target right away, start over. Keep practicing until you can do this easily, and the object appears in your binoculars every time. Learning how to do this quickly and correctly will prevent the frustration of not being able to find the birds that everyone else is seeing. Most binoculars come with a narrow neck strap that is not comfortable. Consider purchasing a broad strap that spreads the weight and does not cut into your neck. Some bird watchers prefer the harness support straps.